The Contemptible Wages of Greed - Charley Brady - Opinons; My Own. I couldn’t really have had worse timing than with last month’s article, could I? There I was, happy out for a change, enthusing about my new job with Hand in Hand, the only charity in the West of Ireland to support the needs of families where a child has been diagnosed with cancer. No sooner was the piece sent to Cliff at IAN than the really shocking news came out of how the funds of some major charities have been gouged into in order to ‘top-up’ the very healthy salaries of some already fat cat ‘health managers’ who should be hanging their heads in utter shame. I had earlier questioned how it was possible for politicians to have been unaware of what was going on. I myself never believed that they were. And since this has been going on for a long, long time it certainly covers Fianna Fail’s Michael Martin and his stint as Health Minister; but as more and more of the characters who were hauled before the Public Accounts Committee (I know, that title makes me laugh too) were seen to have very direct links with FF and –of course—Bertie Ahern, resentment just curdled on my part into pure bloody anger. They should have been dead in the water after the last election but their sick, clammy zombie paws have somehow reached up from the grave to shame us once again. These revelations have had a truly detrimental effect—and one which can only get worse—on those who are working hard in order to raise money for their various charities. It’s an unfortunate fact of life that people will see all of us in the same light and all of us will be tarred with the same brush. Seriously, Openness and Transparency. They actually seem to think that we will listen with all due solemnity to this nonsense and then go away and think to ourselves that Well, this time they have learned their lesson. This time they actually mean it. That is Openness and Transparency. That is why we feel hurt, angry and betrayed by the revelations of the last week: not by what people were being paid, but in the fact that they felt that they had to make up their perceived shortfalls by clawing and gouging extra money from—heaven help us— such outlets as the hospital sweet shop and the car park. How sad is that? At the time of writing that I was unaware that Kiely had also availed of a €200,000 lump sum when he left to go and do other no-doubt charitable works. And yes, of COURSE it was tax free. Also, to put his €140,000 top up in perspective: that figure would either cover Hand in Hand for an entire year or let us expand from covering eight counties to ten. Yesterday the entire board of the Central Remedial Clinic were forced to resign. Not because they weren’t willing to brazen it out, but because the HSE threatened to withdraw the annual €19 million funding for the clinic. This one is going to run and run so we had better brace ourselves for even more damage. 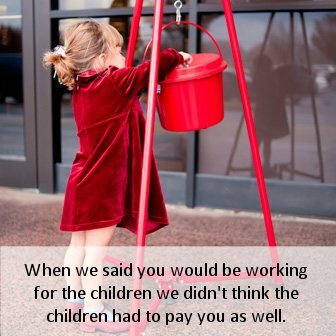 In their greed and hubris do these…people even care about the damage they have done to genuine fundraisers? I doubt it. However, the money being donated to charities is already down an estimated 40%. That means that every time these…people put their little claws in the cookie jar they stole from people who depend on it. In my book, that makes them thieves. So I’m waiting—without holding my breath, I’m not that optimistic—for them to return the money they took. And you know that I’ll still be waiting for that particular New Year miracle this time next year. We, you see, really are open and transparent.